If you’ve been reading me for a while, you may remember I’d gotten hooked on Where’s My Water since Angry Birds had gotten stale. Well, Angry Birds has been spiced up again with the newest version, Angry Birds: Space. Genius marketing if you ask me. The new game is more challenging than the old ones, so I guarantee if you decide to play it, you’ll be hooked. I am. I’m also still waiting for more levels of Where’s My Water – they really need to step it up. What’s your favorite phone (or otherwise) game? Do you play Angry Birds, and if so, have you tried Angry Birds: Space yet?
. For Wordless Wednesday, be sure to visit Wordless Wednesday, Go Graham Go, and JollyMom for more great Wordless Wednesday Posts. 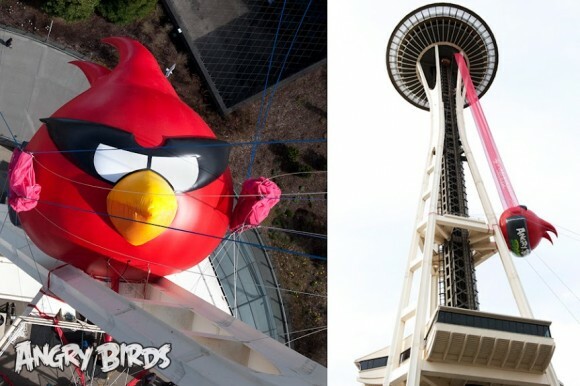 This entry was posted in Wednesday Hops, Wordful Wednesday, Wordless Wednesday and tagged Angry Birds, linky, seattle, space needle, Wednesday Hops, Whimsical Wednesday, Wordful Wednesday, Wordless Wednesday by Stacy (the Random Cool Chick). Bookmark the permalink. You absolutely have to try “Plants vs. Zombies”. It is indeed fun and addicting. As of a little while ago Not only is it available for the PC, Mac , Iphone..but you can find it on Xbox Live. It is a GREAT GAME! That’s crazy!! I was scrolling through the free apps the other day and saw the Space version, haven’t tried it yet. I get frustrated with Angry Birds whenever I get stuck on a level… I like a Parking Car, its a puzzle type! I have only had a smart phone for a few months now. I was out of the loop for a long time, LOL! That’s so cool.. actually being able to ride a real angry bird ride!! I would agree to you Renea that they should also try Plant vs Zombie. On the other hand I think that playing Angry birds is also a way to relieve stress from our body. Hope that I could also see the space needle personally. I was wondering how long it would be before you tried Angry Birds Space. Now, you just need to find a giant stuffed Space Bird for the Princess. MY KIDS WOULD LOVE TO SEE THAT! I’ve never gotten hooked on any of the games out there and I hope to keep it that way. I’d spend way too much time on it. 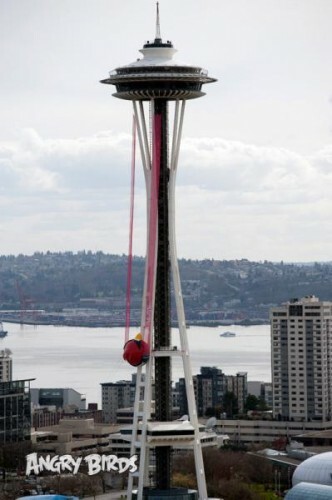 Remember when Almost Live did a April 1st joke about the Space Needle that created a uproar? Funniest thing ever. Proof the people are gullible. I played Angry Birds for a while but got tired of it. That is genius marketing!! I would have loved to see it. I loved Seattle when we visited. I don’t play Angrybirds because I’m not a fan of online games but I do have friends who are totally hooked by this game!!! I like Angry Birds, but oh, does it frustrate me to no end! I’m also a fan of Where’s My Water…and I am so relieved that I’m not the only (adult) one! My kids make fun of me, but then again, when don’t they? Love Angry Birds Space, but I solved it in a few hours. I can’t wait for new levels! I don’t really play games on my phone, but I heartily second the recommendation for Plants VS Zombies – it is a HOOT. Portal and Portal 2 are also lots and lots of fun. AHA! Hilarious! I’ve seen the game but not yet played it, but that is too cute that they put a bird out there. I love it! 😀 Happy WW! That is hilarious! I love Seattle. I don’t play any games on my phone but my kids love Temple Run and Papi Jumps. I really don’t like iPhone games very much, but my husband and daughter make up for it with their love of them. I agree, pretty clever marketing. I’ve only played Angry Birds a couple of times. Haven’t ever heard of Where’s My Water. Oh that is so cool! I love Angry Birds but I can’t play it to long because it makes me AnGrY! Some of the levels drive me nuts. That would definitely get noticed! I like playing DrawSomething and a lot of the time management games- Diner Dash, wedding dash- though I play those on my iPad. Hi, my name is Patrice, and I’m an Angry Birdaholic. Uh oh…I had been off the birds, but of course now have to check this out…just really quickly…just for a second…but maybe then need to see another level…oh dear! That is BRILLIANT!! I love seeing great marketing ideas! That is absolutely amazing! My kids LOVE angry birds and would have loved to see that! Angry Birds has gotten really popular these days. My siblings really like these birds but I don’t. Which one is your favorite bird? Thanks for sharing some pictures above. That is such a cool picture. I started laughing in my office after I saw this and everyone else loved the picture too. I do play Angry Birds but I have not played the space version. Just out of curiosity does anyone still go on Farmville? That was a cool picture? Is it real? Now I am loving this Space Edition. Too funny! Definitely marketing genius.